08 October 2018, 09:09 a.m. 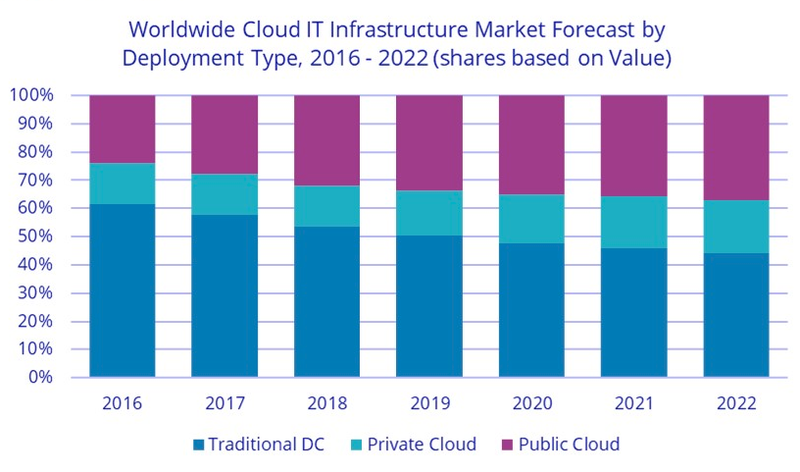 According to the latest worldwide market study by International Data Corporation (IDC), vendor revenue from sales of infrastructure products for cloud IT - including public and private cloud - grew 48.4 percent year-over-year in the second quarter of 2018 (2Q18), reaching $15.4 billion. IDC also raised its forecast for total spending (vendor recognised revenue plus channel revenue) on cloud IT infrastructure in 2018 to $62.2 billion with year-over-year growth of 31.1 percent. Quarterly spending on public cloud IT infrastructure has more than doubled in the past three years to $10.9 billion in 2Q18 - growing 58.9 percent year-over-year. By end of the year, public cloud will account for the majority, 68.2 percent, of the expected annual cloud IT infrastructure spending, growing at an annual rate of 36.9 percent. In 2Q18, spending on private cloud infrastructure reached $4.6 billion, an annual increase of 28.2 percent. IDC estimates that for the full year 2018, private cloud will represent 14.8 percent of total IT infrastructure spending - growing 20.3 percent year-over-year. The combined public and private cloud revenues accounted for 48.5 percent of the total worldwide IT infrastructure spending in 2Q18 - that's up from 43.5 percent a year ago and will account for 46.6 percent of the total worldwide IT infrastructure spending for the full year. Spending in all technology segments in cloud IT environments is forecast to grow by double digits in 2018. Compute platforms will be the fastest growing at 46.6 percent, while spending on Ethernet switches and storage platforms will grow 18 percent and 19.2 percent year-over-year in 2018, respectively. According to the IDC assessment, investments in all three technologies will increase across all cloud computing deployment models - public cloud, private cloud off-premises, and private cloud on-premises. The traditional (non-cloud) IT infrastructure segment grew 21.1 percent from a year ago, a rate of growth comparable to 1Q18 and exceptional for this market segment, which is expected to decline in the coming years. At $16.4 billion in 2Q18 it still accounted for the majority, 51.5 percent, of total worldwide IT infrastructure spending. For the full year, worldwide spending on traditional non-cloud IT infrastructure is expected to grow by 10.3 percent as the market goes through a technology refresh cycle, which will wind down by 2019. By 2022, IDC expects that traditional non-cloud IT infrastructure will only represent 44 percent of total worldwide IT infrastructure spending - that's down from 51.5 percent in 2018. This share loss and the growing share of cloud environments in overall spending on IT infrastructure is common across all regions. "As share of cloud environments in the overall spending on IT infrastructure continues to climb and approaches 50 percent, it is evident that cloud is now the norm. One of the tasks for enterprises now is not only to decide on what cloud resources to use but, actually, how to manage multiple cloud resources," said Natalya Yezhkova, research director at IDC. All regions grew their cloud IT Infrastructure revenue by double digits in 2Q18. Asia-Pacific (APeJ) grew revenue the fastest, by 78.5 percent year-over-year. Within APeJ, China's cloud IT revenue almost doubled year-over-year, growing at 96.4 percent, while the rest of Asia-Pacific (excluding Japan and China) grew 50.4 percent. Other regions among the fastest growing in 2Q18 included Latin America (47.4 percent), USA (44.9 percent), and Japan (35.8 percent). Long-term, IDC expects spending on cloud IT infrastructure to grow at a five-year compound annual growth rate (CAGR) of 11.2 percent, reaching $82.9 billion in 2022, and accounting for 56 percent of total IT infrastructure spend. Public cloud data centres will account for 66 percent of this amount, growing at an 11.3 percent CAGR. Spending on private cloud infrastructure will grow at a CAGR of 12 percent. Interested in hearing industry leaders discuss subjects like this and sharing their experiences and use-cases? Attend the Cyber Security & Cloud Expo World Series with upcoming events in Silicon Valley, London and Amsterdam to learn more. The show is co-located with the IoT Tech Expo, AI & Big Data Expo and Blockchain Expo so you can explore the entire ecosystem in one place.